Thousands of the people in the capital were suffering from a dire shortage of water during holy Ramadan as water supply to households was disrupted due mainly to a gradual fall in the groundwater level. 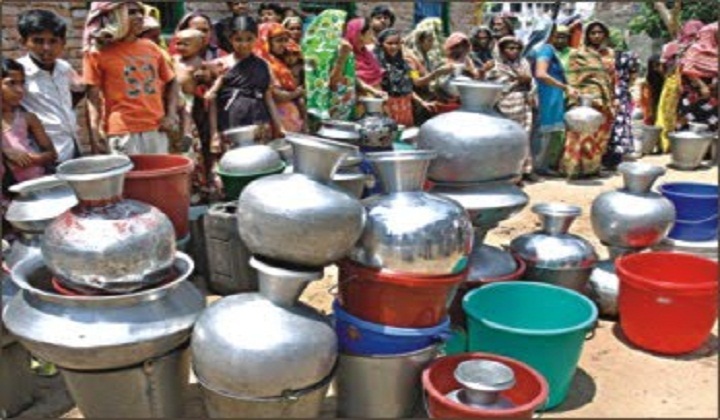 Hundreds of people staged street protests against the dwindling supplies of water during the scorching summer. They demanded adequate water supply to assuage their sufferings. However, WASA officials cited a sharp fall in groundwater level and insufficient water-treatment plants as the main causes of the water crisis. The people living in Rampura, Madhya Badda, Satarkul, Mohammadpur, Hazaribagh, Demra, Donia, Shewrapara, Senpara-Parbata of Mirpur and old Dhaka are the worst sufferers. Several hundred people blocked roads in Demra area of the capital on Monday, demanding adequate water supply during the holy month. The protesters withdrew the road barricades when Dhaka Water Supply and Sewerage Authority (WASA) assured them of meeting their demand. Earlier, two mayors of Dhaka city and acting mayors and officials of several city corporations were briefed at the LGRD ministry on the preparations and problems ahead of Ramadan. At the meeting, LGRD Minister Khandaker Mosharraf Hossain asked WASA officials to provide water to every house in the capital if the piped water supply falls short during Ramadan. However, the WASA failed to do so. Sharifa Begum, a house owner of Shewrapara, said they have not been getting water regularly for two months. “We are buying drinking water from shops and WASA vans to fulfil our demands.” She alleged that many tenants are leaving their houses in the area due to serious water crisis. A WASA official said, “The fact is that water crisis intensifies in summer as the groundwater level falls during the period. We need more new water pumps here. However, we are facing difficulties to set up water-pump houses due to lack of land.” The residents of Dholaipar and Kutubkhali in Donia area alleged that dirty drinking water has been supplied from the WASA in the recent times. The people of Derma area alleged they have not been getting water regularly for 25 days. They complained to the WASA and local representatives several times. Finally, they came down on the street on Monday as no action was taken to resolve the water crisis. According to the WASA, it has the capacity of producing 2.42 billion litres of water a day against the demand for 2.30 billion litres. The WASA runs 712 deep tube-wells and five water treatment plants in the capital to supply water to the capital. About 87 per cent of water comes from deep tube wells while the remaining comes from the treatment plants. The water supply authority is carrying out their work in 11 mode zones —- 10 in the capital and another in Narayanganj.